This package can generate complete thoughts from a verb and a noun. It takes a verb and an noun and uses the Moby thesaurus file to extract synonyms. Complete thoughts may be found by looking for any of the verb synonyms in the noun synonyms. Prize: PHP Tools for Visual Studio Personal license Well formed sentences are based on grammatically correct combination of verbs and nouns, thus forming what is called complete thoughts. This package provides a solution for generating complete thoughts from verbs and nouns. It also allows verifying if sentences may have been written by bots that generate fake text by checking if the combination of verb and noun words is present in sentences. It uses the Moby Thesaurus to get the "complete thought" from a verb and a noun. 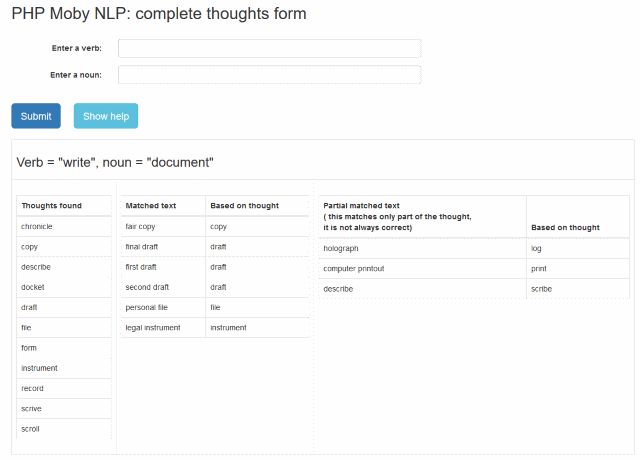 This is meant for Natural Language Processing (NLP) tasks. First: open the index.php, a form will appear. Third, enter a noun like "dog", "cat", "house" or "car". Finally, press Submit, wait for the result. The result may take up to 2 seconds. What can I do with the result? First, you can use it in spam killers: if there are complete thoughts in a text, the text is probably not fake. Second: you can use this for creating reports and understanding text. Third: this could be used as suggestions in search engines. Looking up words in the thesaurus can take up to 2 seconds. You should only lookup words if you need to. Can I use a different set of words (=thesaurus)?